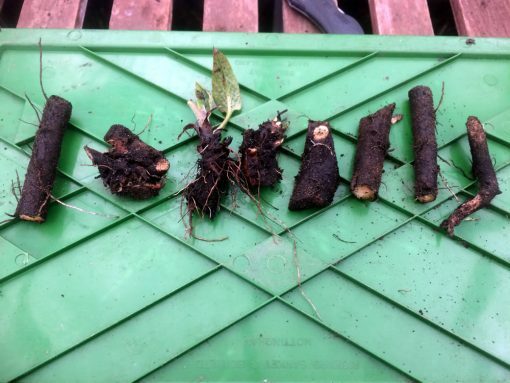 8 root cuttings of Comfrey Bocking 14, including full instructions for growing and propagation. We also sell comfrey crown cuttings. We raise all of our comfrey plants without the use of chemicals. Full post-sales support by email, and a guarantee* that these will take and grow – we will replace any that fail! Comfrey is an essential plant in any garden. It’s a true wonder-plant, a great attractor for pollinators including bumble bees, and has many uses for improving soil fertility and structure, and as a feed for plants. 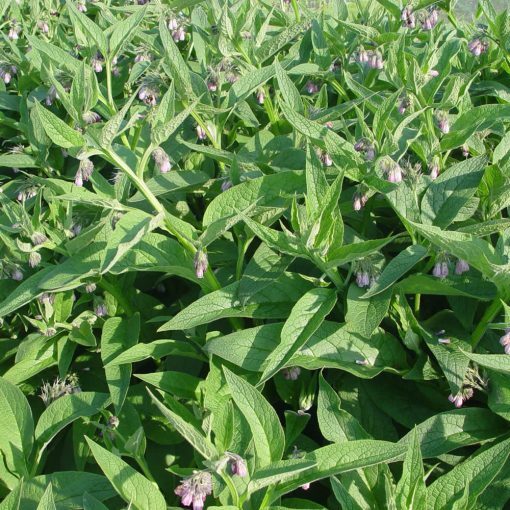 We’ve been growing comfrey since 1999, and only supply genuine Bocking 14. Although comfrey is easy to propagate, and can be found extensively in the wild, do not be tempted to plant wild comfrey in your garden – it will spread quickly and take over your garden. Bocking 14 is a variety developed by Lawrence D Hills at the Henry Doubleday Research Association (HDRA), and does not spread except via root cuttings. 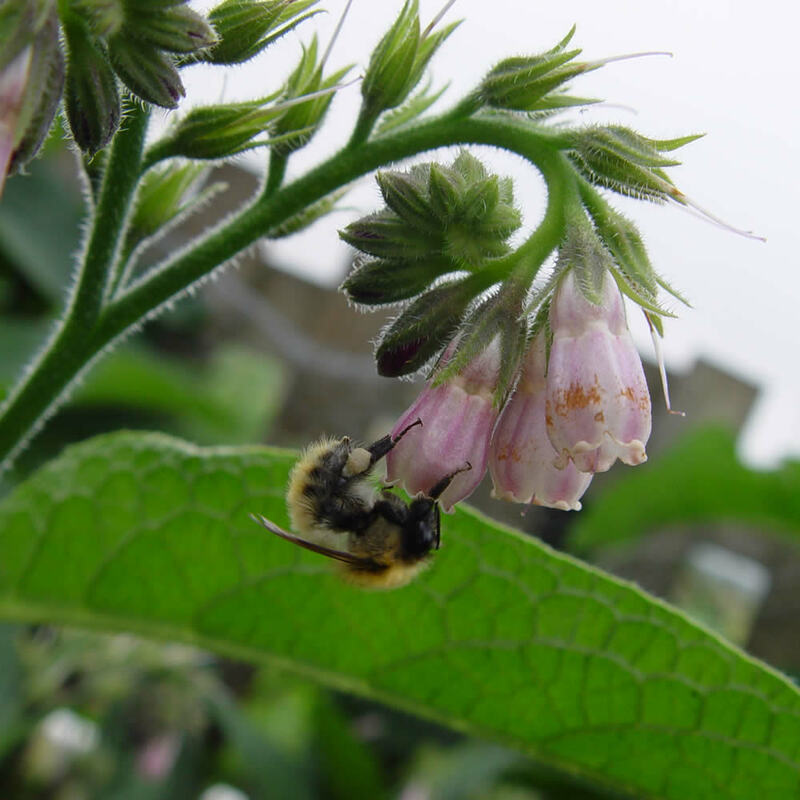 Comfrey is very quick-growing, and can be cut up to 4 times per year in the UK. It has a very deep tap root that draws many trace elements from deep in the soil. This makes it ideal as a plant feed, allowing you to apply those trace elements to the other plants in your garden. 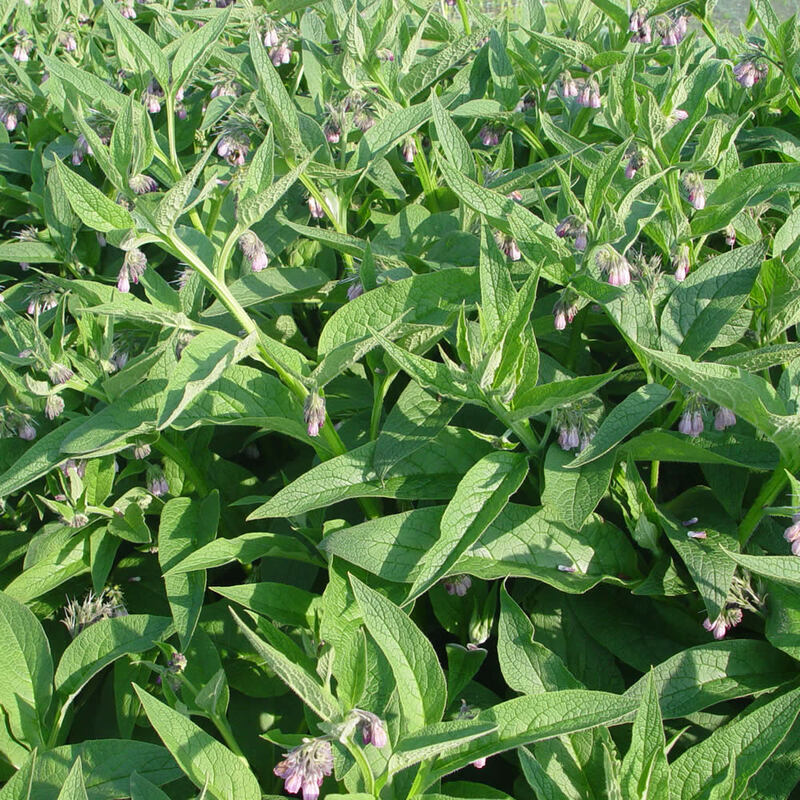 Cut and left to decompose in a covered container, comfrey produces a thick, dark liquid that can be diluted for use as a liquid feed. Think of it as home-made Tomorite, but better! We use it to feed all of the fruit and vegetables in our garden, including tomatoes. Cut, it can be used very effectively as a mulch, suppressing weeds, retaining soil moisture, while slowly releasing nitrogen and other elements to feed the mulched plant. 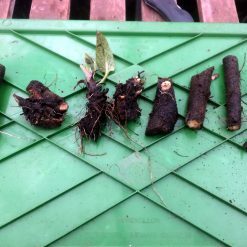 We’ll supply root cuttings – these can be either directly planted in their permanent location, or planted into pots and transplanted at a later date. Plant 1-2 inches below the surface, 2-3 feet apart. Plants can cope with being fed intensively – it will absorb nitrogen from most sources, including ‘hot’ manure. The plant is ready for cutting once it has flowered and flowers are starting to die back. Established plants will be 4-5 feet in height at this stage. Cut 3-4 inches above ground, taking care not to cut any emerging new shoots. Over-winter comfrey with a thick mulch of manure. * Guarantee: If you follow the growing instructions provided and any of your cuttings don’t take, we’ll replace them free of charge. Maximum one round of replacements per customer. Comfrey cuttings received promptly, in good condition and with excellent growing instrcutions. Planted them up in pots and all have taken. Couldn’t be better, very happy.